Photo by Annie Gumbley, no reproduction without permission. 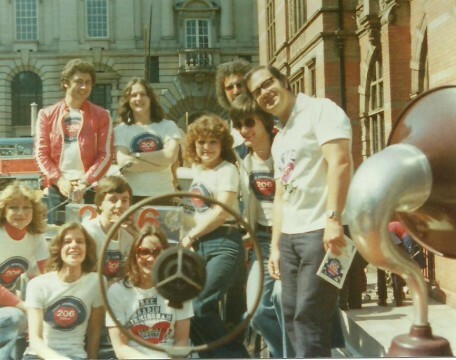 This photo is of the Radio Birmingham float, from the Birmingham Carnival, dating from the 1970s. Producer and presenter Pete Simpkin is on the right handside, in the white shirt. In the red jacket at the back is Early Show and Traffic presenter Peter York,next to him Alex Lester (now the Radio 2 Thro’ the night presenter), just behing Annie G is David Lowe who was a tech op, now writes TV theme tunes. Next to Annie, is Kathy Nelson (Kathy Scott then), behind to the left is Crol McLeod and to the left Clair ? ex copy taker in the Newsroom. Please add a comment if you can identify the others. Thanks to Pete Simpkin and Annie Gumbley-Williams for identifying many in the photo. Next to me is Kathy Nelson (Kathy Scott then), behind to the left is Crol McLeod and behind to the left is Clair ? ex. copy taker in newsroom.